I there any way to achieve same? I believe what you mean by secondaries is related entities. 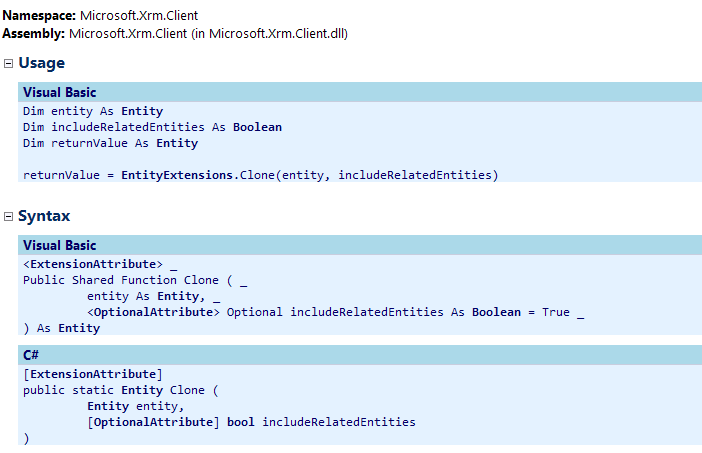 The boolean parameter in the Clone Method is actually an indicator as to whether you want to clone the related entities as well. However the parent record from which you are cloning, should also have the related records fetched within itself. For e.g – If you retrieve the account entity record and the associated contacts also and then try to clone this record by passing true in the clone method, it should clone the related records as well. I haven’t tried that though. Please check and let me know! but Microsoft.Xrm.Client does not exist any more at CRM 2016. Do You know what is its replaceable? You are right. Microsoft has made a decision to move everything to Microsoft.XrmTooling. However you can still use the 2015 SDK dll for 2016 projects. Also you can look forward to nuget packages and downloads in visual studio. it is still available there.